Coming out of the 2018 Infocast Transmission Summit, ScottMadden shares key takeaways related to strategies and policy considerations for an uncertain grid market, including infrastructure challenges and market reform. Harvesting the benefits you expect from advanced metering infrastructure (AMI) and smart grid is not as easy as you might think. 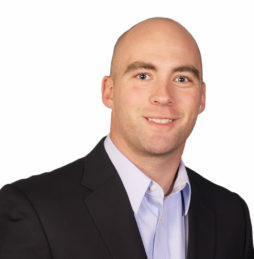 View this report to learn how AMI and smart meters are being deployed, the benefits you should be harvesting, and how ScottMadden can help support your journey. California and New York have approached the question of distributed energy resource integration differently. The two states have seen very different levels of DER penetration, and their policy goals reflect different objectives. Learn more in this new report. Data is being produced at an exponential rate in all sectors, accelerated by mobile technology, the internet of things, and easily accessible, cost-effective, cloud-based computing. Driven by the proliferation of sensor technology and advanced metering infrastructure (AMI), utilities are also collecting more data than ever as smart grids get smarter. With the advent of smart appliances, ever greater computing power, and the internet of things, this trend is expected to continue. As the volume and quality of utility data sets grows, there may be additional value streams that the utility can capture, in conjunction with other third parties that are becoming increasingly active participants in grid management. As utilities explore these different value streams, they should be conscious of, and proactively address, the potential privacy and cybersecurity risks. Furthermore, the development and testing of these systems and processes take time, so if utilities are to reap these benefits, planning should begin today. In addition to the traditional utility services to which these data sets are applied, increasingly the data is being sought by third parties to provide grid services. This mirrors the explosion of sources and value of data in other sectors, such as financing and/or retail. According to a 2014 study by the Federal Trade Commission, data broker products for the top nine companies generated $426 million in revenue in 2012. By 2016, the top broker generated more than $800 million in revenue. Big data is touted as a “new natural resource,” and the value is expected to continue to rise as greater sensing and communication equipment is deployed. Reviewing some of the current use cases for customer and system data may provide insight to utilities not yet maximizing the value of their data. (with Consent). With the growing adoption of advanced metering across the country, a customer’s sub-hourly usage data is typically available in a utility’s meter data management system. Additionally, the customer information system houses key demographic data. This data is valuable to third-party DER providers in building a business case for their products and services, and it could be used to reduce customer acquisition costs by more selectively targeting their marketing. While the rules governing whether a utility is able to sell this data are still pending, there is a clear interest in providing customers a way to share this data and indicate their consent in doing so. The Green Button Connect initiative, which is being implemented for most New York utilities (among many others), is a national standard for the format of meter usage data accompanied by a secure and automatic data transfer protocol. Currently, New York utilities are obligated to provide basic usage data (under the premise that the AMI systems are rate based), but discussions are still underway regarding whether the utilities may sell “value-added” data. The sale of this data potentially represents an additional utility revenue stream in an environment of flat revenues. Enhancing Customer Energy Knowledge. One of the greatest hurdles to customers changing their energy use behavior is their lack of knowledge and engagement with their bill and other utility communications. According to GreenTech Media, on average customers spend eight minutes per year with their electric utility. A pile of raw usage data on five-minute intervals certainly doesn’t sound like the path to engagement. However, if the information can be packaged in a compelling, easy-to-understand, and actionable message, utilities can reap the value of this data through greater system efficiency (i.e., a larger load factor) or earning incentives for greater Demand Side Management (DSM) participation. This could take the form of shifting customer load from off-peak hours or greater enrollment in utility energy efficiency or demand response programs, which often are incentivized or can be bid into wholesale markets. Capturing these indirect value streams is not as direct as selling the data and requires a lot of inter-departmental coordination (e.g., customer service, DSM programs, system engineering); however, the system efficiency benefits may well make it worth their while. Providing System Data for Targeted Relief. Though overall load growth in many areas has been flat or declining for years, often there are pockets of load growth that require incremental infrastructure buildout. If these traditional utility solutions require new substations, the costs to implement the traditional solutions can often soar into the billions. The system data that can help non-traditional DER providers bring solutions to bear include the hours of peak load, the amount of projected overloads by year, and the geographic and electrical boundaries of the need. This information may be packaged as part of an RFP for the solutions in the area of system need. To the extent that utilities can earn an incentive or rate base regulatory assets for the deferral of traditional solutions, they can unlock the value of system data. Generation (DG). One of the greatest drivers of change in the electric power industry in the last 15 years has been the proliferation of distributed generators—largely solar powered. While the exact value of these generation sources is still hotly contested (Value of DER, Value of Solar), what is roundly agreed upon is that DG has different values, depending on the location of source, the time of day it is operating, and the coincidence of that output with local grid needs. Utilities are increasingly being pushed to provide hosting capacity data, which EPRI defines as “the amount of DER that can be accommodated without adversely impacting power quality or reliability under existing control configurations and without requiring infrastructure upgrades to the primary line voltage and/or secondary network system.” While the push for providing this data has thus far required utilities to do so at their own expense, as DG are more efficiently sited, it can help utilities manage the costs associated with interconnections (which are typically paid by the customer and do not go into rate base) and more easily meet incentive goals associated with renewable standards. Another example of using data to more efficiently bring DG, and solar in particular, onto the grid is the Orange Button. Sponsored by SEPA, this effort seeks to standardize the financing data related to solar projects to lower transaction costs and expedite the interconnection process. However, this may be easier said than done. As noted by Green Tech Media “many utilities rolled out smart meters to customers before they had the capability to completely assimilate the data. Utilities now need to focus on the foundational building blocks to unlock this data through a data analytics road map and skillset development. 2. Develop a Data Analytics Road map and the Associated Skills. Legacy data analytics tools for utilities were built for a static, one-way system. This system is increasingly being modernized for two-way data flows and an exponential increase in the number of data points. To properly understand the value of this data and how it can enable the business, utilities need to determine how their data strategy fits into the overall value proposition. Once this data value proposition is understood, the utility can develop a framework for understanding which data projects will provide the most value and how they best fit into the overall information technology architecture. Based on this information, the utility can develop a data analytics product road map and the necessary skills needed to support implementation. The value of the data is accretive and can be developed in phases. 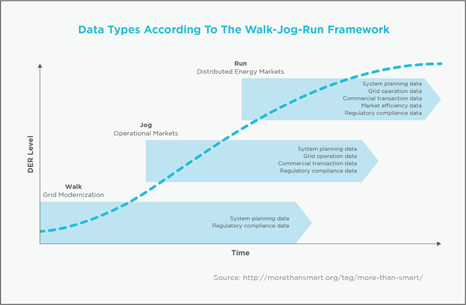 The walk-jog-run framework for data types developed by More Than Smart offers a path to building the value of data as DER penetration increases. 3. Implement a Data Governance and Security Policy. The recent Equifax security breach has exposed systemic data security vulnerabilities in a variety of industries. Utility customers expect that their financial information will be protected against fraud and identity theft and that usage data is anonymized and protected when it is shared. These customer security pressures are furthered by evolving NERC CIP requirements and Federal Trade Commission data privacy provisions, as well as a growing number of state-based rules, such as the storage and usage of AMI data. Utility Dive’s most recent State of the Electric Utility Survey, an annual survey of more than 600 utility professionals, named cyber and physical security the most pressing concern for their companies, with 72% saying it is either “important” or “very important” today. New York’s Public Service Commission recently issued orders for data aggregation standards and data publication guidance to strike a balance between protecting customer privacy and providing useful energy data. These standards use a 15/15 general standard and a 4/50 standard for building owners, where the first number refers to the minimum number of accounts in an aggregated group and the second number refers to the maximum contribution of any single account to the overall profile. 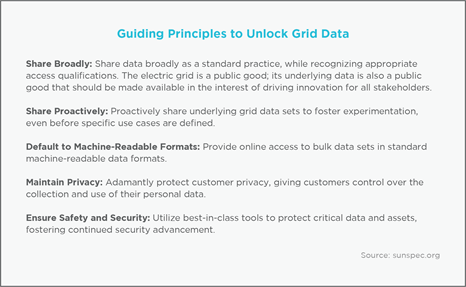 Furthermore, New York utilities are required to publish and maintain data sets that adhere to these privacy principles on NYSERDA’s website. These datasets will include loading and customer counts by rate grouping and location (municipality or zip code). Data governance establishes the decision rights, stewardship, controls, and definitions for all data within the utility’s responsibility. By developing and adhering to such governance practices utilities can mitigate the risk of inaccurate and unsecure data. Implementation of a robust data governance policy should be grounded in industry best practices, and also customized to work within their existing organizational and IT support construct. 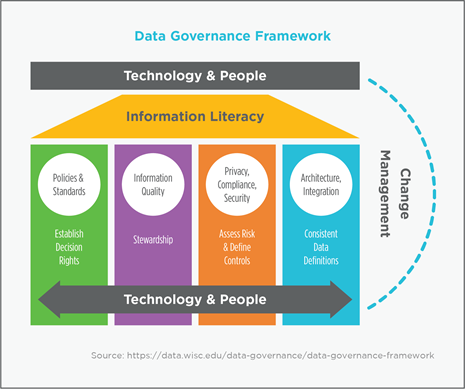 In addition to the people and technology, a robust data governance policy is anchored by policies and standards; information quality; privacy, compliance, and security; and architecture and integration. Technology firms like Nest (owned by Google) are growing and collecting customer data. This change was exemplified by Nest’s recent deal to partner with Southern California Edison to deliver 50 megawatts of demand response in a constrained area of the grid that may run short of power during peak periods. 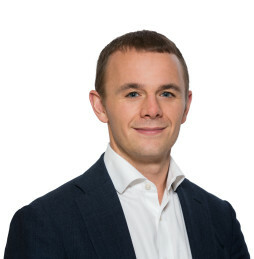 In addition, many players continue to develop more advanced data scraping techniques to pull information from rate case filings and other publicly available information to better understand system data. Combined with developments in data analytics, these firms pose a threat to disintermediate utilities from their customers and further disrupt the business model of the utility of the future. On the utility side, advanced distribution systems analytics data products, like Qado Energy’s GridUnity software platform, are now beginning to be used by the Hawaiian Electric Company and Southern California Edison to unlock the value of utility data. What seems to be taking shape is a race to capture the value of the data. By understanding how these innovative data products further the utility’s value proposition, utilities can keep pace by taking the first step in determining where to focus development efforts and capture additional value streams rather than being relegated to managing wires and poles.